Is your life crazier than usual? Do you wonder how you will get it all done–even when you love everything about the Holiday Season? Kula and Pilikia send greetings and talk about their many roles in the household. They have many things they see as the norm. Their dad (Brent) goes away and sails all over the world. They have to wait at home with Mom in the home port for his return. They keep Mama safe. Their Mama goes to work and sometimes they just have to watch the property. That can be a big job with nosy neighbors and whatnot. There is staying in good shape mode in their household too! It involves hiking, running, biking, exploring, and whatever else the folks add to the agenda. Finally, there is the sofa warmer responsibility. PS: Dad wanted to make sure you knew we were keeping up our end of the deal here in California. Maizie, age 4.5, shows her delight at Cannon Beach today. No ball, no frisbee, no sticks. Just chasing freely at her pace, going after birds and pouncing on clam shells with glee! Lots of digging spurts in the wet sand and happily greeting people and dogs all along the beach. All smiles for this happy girl today! Maizie and Linda recently brought home a medal. Congratulations to the both of you. Training has paid off. She is one of the many OwyheeStar long-distance running companion Weimaraners. Does the Weimar have a “tude” at your house when you don’t get it right? Or maybe this happens in the car. It could be anywhere. Roo likes to travel and getting home is not his cup of tea. He is not the Weimar heading for the barn per say. He and Mama Wendy had just returned from another Oregon Coast adventure. Who would want it to end? 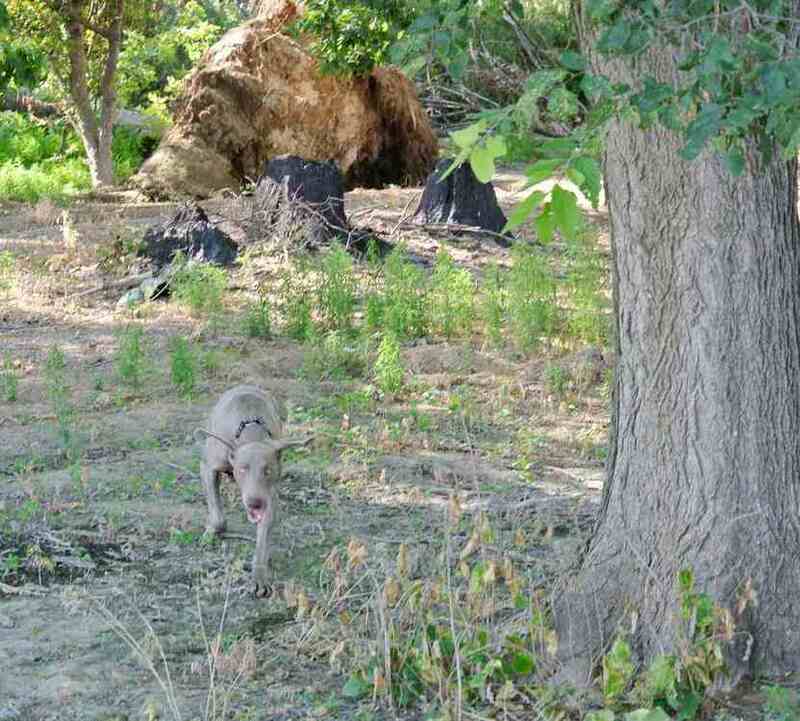 For those wanting the leave in the backyard dog, the Weimaraner is not for you. Whatever you are doing they are wanting to be invited. We think of them as the Velcro Dog extraordinaire. If you don’t understand this and a few other typical Weim traits, there might be trouble in your future together. Wendy does it all perfect. Thank you for that, Wendy. (Dec 26, 2015)–As you can see the booties worked out to be pretty funny. I took them for a walk and not even halfway around the block they were walking normally. We are heading up to the snow on Wednesday, so we will have the real test then! They love the snow! I need to do some work on their booties to get them not to fill with snow…..
(January 6, 2016)–Kula is at the vet today having a few masses removed, one under his front leg ‘armpit’ was the main reason, the vet suggested removing it before it started to affect his walking. So we are having his teeth cleaned while he is under anesthetic! Pilikia is with me and is a much different dog when her big brother is not around; she is way more subdued and not quite sure what to do! Anyway, I pick up Kula at 6:00 tonight. Pilikia joined your family as a young girl. Kula was already an integral part of the household as well as the family lifestyle. She has never known being the solo Weimaraner; therefore, it must have seemed very odd to her. She might feel like a fish out of the water. As you understand, these guys are creatures of habit. They like routine and companionship. Thank you for sharing this story with us. It is a very fun post. Portland (Oregon) has the motto. Keep Portland Weird. You can find it on signs, painted on buildings, and on those who wear attire. If you are curious or brave you can check it out at their website–click here! In light of this information, why would we think it odd to find a group of Weim-nuts growing on trees in and around that area? Holly (who resides with Goldee and Autzen) is our lead cheerleader. She doesn’t stand alone by any means; however, no one is turning more cartwheels. Recently, we heard from this lovely Weim-nut. Here is what she said! As you can imagine my mom and I like to make crazy plans, and one of those plans involve multiple Owyheestar a Weimars 🙂 I was wondering if you’d be willing to put an APB out for Portland Weims. We are looking for all available Weim-nuts in the Portland area on December 12th at 3 pm. If people are interested, they can email me (Holly) at hollyhaffey26.2@gmail.com. We did our annual family photos today (November 29, 2015), and Goldee was in prime modeling form. She couldn’t get enough of the camera. I can’t even begin to tell you the joy Goldee has brought to Joe, Holly and Autzen. As we walked along the path today, the two dogs continually checked up on each other and from day one have been the best of friends. It amazes me how different the two girls personalities are. Of course, as Holly was setting up the session today, she wanted to make sure that Emma, the girl that turned her into a Weimienut was in the photo too. I can’t help but think that Emma had all of Holly’s best interests in mind when she put Holly and Goldee together. Cliff and I are speechless and totally blown away by these lovely photos. Thank you, Terri and Holly. You have blessed us beyond anything we could have imagined. It is also important to disclose that Holly’s email is posted with permission. We do not disclose contact information for a number of reasons (without permission). We also are very limited with available time to get involved in helping folks make a connection. We live in a wonderful time where it is possible to find others with the same interest via Facebook. For those wishing to connect with Terri for a personal pet photo session, please click here! Whatever your passion (small critters, cats, dogs, birds (even a pet chicken with a sweater) Terri is able to capture a memory you can cherish long down the road. We cannot put into words what she can do with the camera, but you can check it out for yourself. Dogs grow until the growth plates close. In large breeds such as the Weimaraner, the growth plate closure tends to take longer than in small breeds. Even with the Weimaraner, the growth plates close by the time they are two years old. Most experts agree (and there is scientific evidence to back up these statements) typically the growth plates close by the time they reach fifteen months. The leg bones draw intense scrutiny for two reasons. First, they receive the brunt from any type of high impact during exercise; secondly, we know that the bones (in the legs) close later than some other bones. Growth plates can close as early as two years of age. The rib cage is the last area to complete the growth stage and become set. The growth plates in the rib cage usually close around three years of age. Between two and three years of age, the Weimaraner will still fill out, muscle-up, and gain fat. Actual growth is impossible once the growth plates close. Information on this topic is mixed and confusing. This is largely because growth plate closure is not an exact science, and because breeds vary. Even within a breed, such as the Weimaraner, size and other factors affect the growth-plate closure timeline Some agility facilities will not allow you to bring your Weimaraner without actual proof of growth plate closure, and that means X-ray documentation. With mixed messages, we defer to the Pat Hastings, who is considered the expert in canine structural development. She is teaching in her seminars and writing in her books that the typical large breed dog’s (leg) growth plates will close around two years of age. Therefore, it is important to determine what is the appropriate exercise for the young developing Weimaraner. Cliff suggests that you limit sustained strenuous high-impact exercise to one-half-hour a day. That would mean you run one direction for fifteen minutes, and turn around and head home. Later, you could play fetch on the turf to get in some easier joint exercise. The importance of taking caution to protect the joints cannot be overstated. Damage can happen without notice, and show up later in life. We place a lot of Weims with runners–casual and long-distance runners. We always caution people about hitting the road in the first year. Being a serious athlete, it is very difficult to postpone this type of activity. 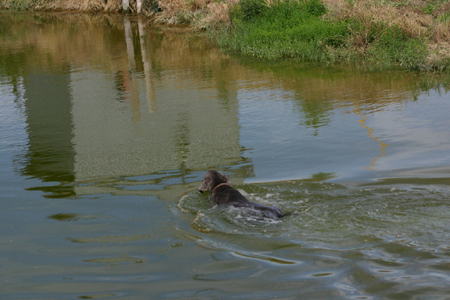 In lieu of these longer runs, we suggest swimming the Weimaraner. 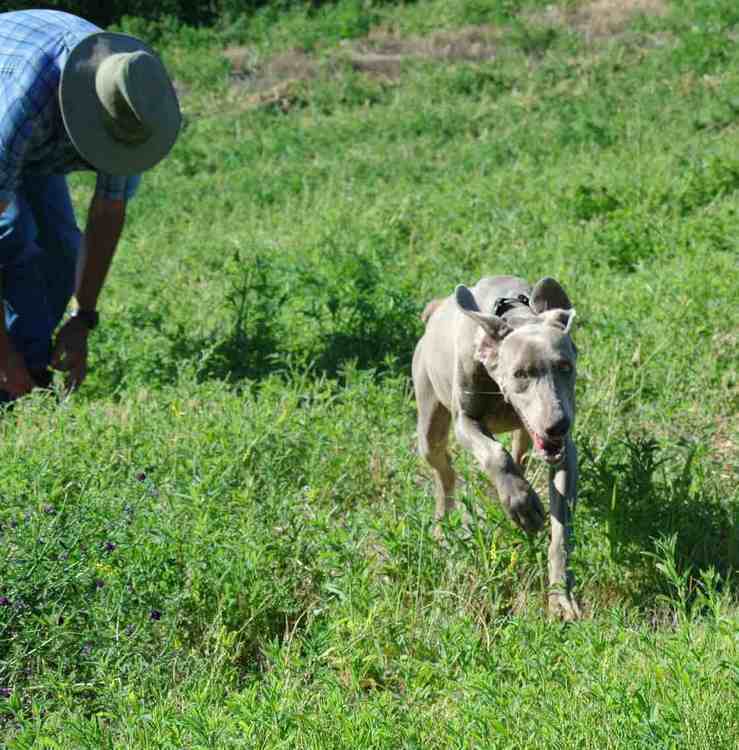 This is the perfect exercise to set the Weimaraner up for the field or running. It is a low-impact exercise that burns a lot of energy. 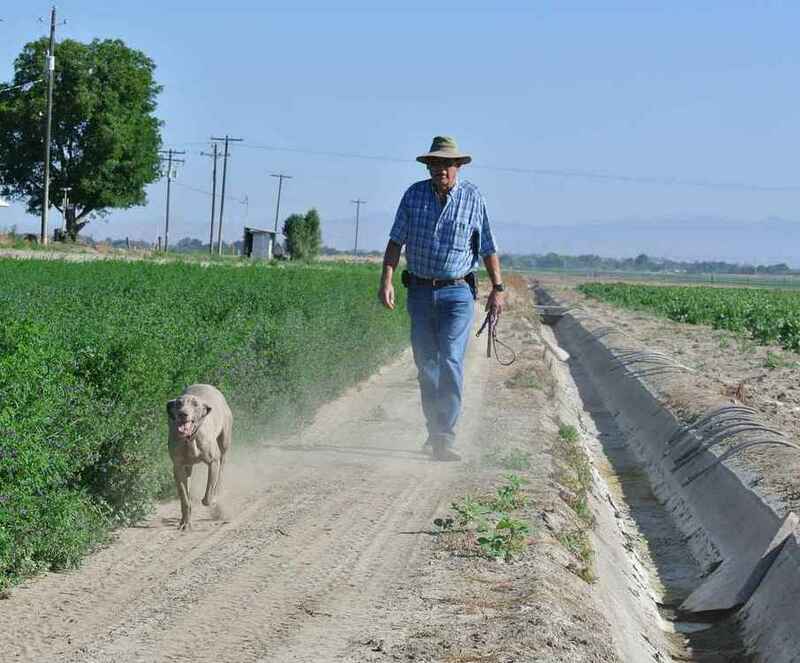 Although it takes a knack to get the Weim water retrieving, the dividends are many.